Y. He, J. Zhang, S. Singh, E. Garcell, A.Y. Vorobyev, B. Lam, Z. Zhan, J. Yang, and C. Guo, Appl. Phys. Lett. 114, 133107 (2019). J. Yong, S.C. Singh, Z. Zhan, F. Chen, C. Guo, ACS Appl. Mat. & Interfaces 11, 8667 (2019). S.A. Jalil, J. Yang, M. ElKabbash, Y. Lei, W. He, and C. Guo, Opt. Lett. (in press, 2019). C. Yao, S.S. Singh, M. ElKabbash, J. Zhang, H. Lu, and C. Guo, Opt. Lett. 44, 1654 (2019). C. Jin, J. Zhang, C. Guo, Nanophotonics 8, 451 (2019). ACS Appl. Energy Mat. (2019) doi: 10.1021acsaem.9b00091. J. Yong, Q. Yang, C. Guo, F. Chen, and X. Hou, RSC Advances (in press, 2019). Y. Fu, R.A. Ganeev, G.S. Boltaev, S.K. Maurya, V.V. Kim, C. Zhao, A. Rout, and C. Guo, Nanophotonics (2019) doi:10.1515/nanoph-2018-0213. C. Zhou, Z. Yu, W. Yu, H. Liu, H. Zhang, C. Guo, Microchimica Acta 186, 251 (2019). Z. Zhan, E. Garcell, and C. Guo, Mater. Res. Express 6, 075011 (2019). A. Kotb, K. Zoiros, and C. Guo, J. of Computational Electronics (2019)doi:10.1007/s10825-019-01329-z. X. Li, Z. Pan, Z. Li, X. Wang, B. Saravanakumar, Y. Zhong, M. Xu, Y. Liao, L. Xing, Y. Qiu, C. Guo, and W. Li, J. Power Sources 420, 22 (2019). J. Lu, J. Yang, S. Singh, W. Xin, Z. Yu, C. Guo, Langmuir 35, 3562 (2019). A. Rout, G.S. Boltaev, R.A. Ganeev, Y. Fu, S.K. Maurya, V.V. Kim, K.S. Rao, and C. Guo, Nanomaterials 9, 291 (2019). A. Kotb, K. Zoiros, and C. Guo, Photonic Network Comm. (2019) doi:10.1007/s11107-019-00844-0. Z. Yu, W. Yu, C. Guo, Chinese Optics (in press, 2019). R.A. Ganeev, G.S. Boltaev, V.V. Kim, and C. Guo, Nanomaterials 9, 572 (2019). R.A. Ganeev, G.S. Boltaev, K. Zhang, S.K. Maurya, M. Venkatesh, Z. Yu, V.V. Kim, and C. Guo, OSA Continuum 2, 1510 (2019). A. Kotb and C. Guo, Opt. & Quantum Elect. 51, 58 (2019). B. Lam and C. Guo, Light: Sci. & Appl. 7, 30 (2018). W. Yu, F. Li, L. Yu, M.R.K. Niazi, D. Corzo, C. Ma, S. Dey, M.L. Tietze, U. Buttner, X. Wang, Z. Wang, M.N. Hedhili, C. Guo, T. Wu, A. Amassian, Nature Comm. 9, 5354 (2018). J. Xing, X. Zheng, Z. Yu, Y. Lei, Y. Zou, C. Zhao, H. Yu, D. Pan, L. Hou, D. Zhou, S. Qu, J. Yang, R.A. Ganeev, W. Yu, C. Guo, Adv. Opt. Mat. 6, 1800411 (2018). S.C. Singh, C. Yao, H. Li, W. Yu, Z. Yu, and C. Guo, Nano Energy 51, 774 (2018). D. Li, K. Jiang, X. Sun, and C. Guo, Adv. in Opt. & Photonics 10, 43 (2018). W. Xin, H. Jiang, X. Li, B. Wang, X. Zhou, J. Lu, J. Yang, C. Guo, Z. Liu, and J. Tian, Adv. Mat. Interfaces 5,1800964 (2018). Z. Yu, W. Yu, J. Xing, R. Ganeev, W. Xin, J. Cheng, C. Guo, ACS Photonics 5, 1619 (2018). C. Zhou, H. Geng, and C. Guo, Acta Biomaterialia 80, 58 (2018). X. Zheng, C. Cong, Y. Lei, J. Yang, C. Guo, Nanomaterials 8, 458 (2018). Y. Fu, R.A. Ganeev, P.S. Krishnendu, C. Zhou, K.S. Rao, C. Guo, Opt. Mat. Exp. (in press, 2018). R.A.Ganeev, G.S. Boltaev, V.V. Kim, K. Zhang, A.I. Zvyagin, M.S. Smirnov, O.V. Ovchinnikov, P.V. Redkin, M. Wostmann, H. Zacharias, and C. Guo, Opt. Exp. 26, 35013 (2018). J. Yong, S.C. Singh, Z. Zhan, J. Huo, F. Chen, X. Hou, and C. Guo, ChemNanoMat 4, 1 (2018). H. Qiao, J. Yang; J. Li; Q. Liu; J. Liu, and C. Guo, Materials 11, 2380 (2018). H.U. Lim, J. Kang, C. Guo, and T.Y. Hwang, Appl. Surface Sci. 454, 327 (2018). K. Zhang, S.K. Maurya R. Ganeev, K. Rao, C. Guo, J. of Optics 20, 125502 (2018). A. Kotb, K. Zoiros, and C. Guo, Photonic Network Comm. (in press, 2018). A. Kotb, K. Zoiros, and C. Guo, Optics & Laser Tech. 108, 426 (2018). E. Garcell and C. Guo, J. Appl. Phys. 123, 213103 (2018). A. Kotb, K. Zoiros, and C. Guo, J. of Computational Electronics 17, 1640 (2018). R. Fang, A.Y. Vorobyev, S.C. Singh, and C. Guo, Jap. J. Appl. Phys. 57, 8S2 (2018). E. Garcell, B. Lam, and C. Guo, Appl. Phys. A 124, 405 (2018). J.L. Cheng and C. Guo, Phys. Rev. B 97, 205406 (2018). R. Ganeev, K.S. Rao, Z. Yu, W. Yu, C. Yao, Y. Fu, K. Zhang, C. Guo, Opt. Mat. Exp. 8, 1472 (2018). Q. Liu, N. Zhang, J. Yang, H. Qiao, and C. Guo, Opt. Exp. 26, 11718 (2018). Y. Ogata, A.Y. Vorobyev, C. Guo, Materials 11, 501 (2018). J.L. Cheng and C. Guo, Phys. Rev. B 97, 125417 (2018). Y. Lei, N. Zhang, J. Yang, and C. Guo, Opt. Exp. 26, 5102 (2018). C. Guo, Iron & Steel Technology 15, 104 (2018). A.Y. Vorobyev and C. Guo, Appl. Phys. Lett. 99, 193703 (2011). W. Lai, L. Pei, and C. Guo, Phys. Rev. A 84, 043413 (2011). T.Y. Hwang and C. Guo, Opt. Lett. 36, 2575 (2011). T.Y. Hwang and C. Guo, J. Appl. Phys. 110, 073521 (2011). A.Y. Vorobyev and C. Guo, J. Appl. Phys. 110, 043102 (2011). A.Y. Vorobyev and C. Guo, Opt. Express 19, A1031 (2011). T.Y. Hwang, A.Y. Vorobyev, and C. Guo, Opt. Express 19, A824 (2011). A. Y. Vorobyev, V. S. Makin, and C. Guo, Phys. Rev. Lett. 106, 249402 (2011). A.Y. Vorobyev and C. Guo, J. of Nano Research 14, 57 (2011). T.Y. Hwang and C. Guo, J. Appl. Phys. 109, 083521 (2011). A.Y. Vorobyev and C. Guo, J. of Natural Science 3, 488 (2011). A.Y. Vorobyev and C. Guo, Appl. Surf. Sci. 257, 7291 (2011). Y. Wu, A.Y. Vorobyev, R.L. Clark, C. Guo, Appl. Surf. Sci. 257, 2432 (2011). T.Y. Hwang and C. Guo, Appl. Phys. Lett. 101, 021901 (2012). A.M. Heins and C. Guo, Opt. Lett. 37, 599 (2012). T.Y. Hwang, A.Y. Vorobyev, and C. Guo, Appl. Phys. A 108, 299 (2012). T.Y. Hwang and C. Guo, J. Appl. Phys. 111, 083518 (2012). Y. Sun, A.Y. Vorobyev, J. Liu, C. Guo, and P. Lu, Chinese Medicine 47, 486 (2012). A. Y. Vorobyev and C. Guo, special issue on Nanomaterials by Laser Processing, Science of Advance Materials 4, 432 (2012). S.C. Singh, H.B. Zeng, C. Guo, and W. Cai (Eds) (John Wiley & Sons, Weinheim, Germany, 2012). S.C. Singh, H.B. Zeng, C. Guo, and W. Cai, in Nanomaterials: Processing and characterizations with Lasers, Ed. by Singh, Zeng, Guo, and Cai (John Wiley & Sons, Weinheim, 2012). Chapter 1, p1-34. S.C. Singh, H.B. Zeng, C. Guo, R. Gopal, and W. Cai, in Nanomaterials: Processing and characterizations with Lasers, Ed. by Singh, Zeng, Guo, and Cai (John Wiley & Sons, Weinheim, 2012). Chapter 2, p35-68. A.M. Heins and C. Guo, in Nanomaterials: Processing and characterizations with Lasers, Ed. by Singh, Zeng, Guo, and Cai (John Wiley & Sons, Weinheim, 2012). Chapter 3, p 69-84. A.Y. 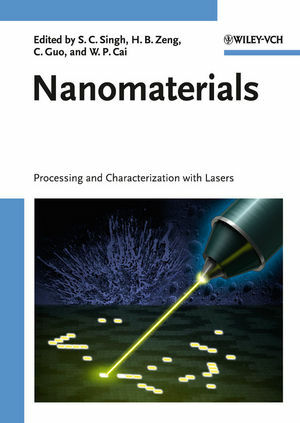 Vorobyev and C. Guo, in Nanomaterials: Processing and characterizations with Lasers, Ed. by Singh, Zeng, Guo, and Cai (John Wiley & Sons, Weinheim, 2012). Chapter 5, 203-218. J. Luo, D. Lu, C. Du, Y. Liu, D. Shi, S. Gong, and C. Guo, J. Phys. B 45, 035402 (2012). A.Y. Vorobyev and C. Guo, Laser & Photonics Review 7, 385 (2013). A.Y. Vorobyev and C. Guo, App. Phys. Lett. 102, 074107 (2013). A. Heins and C. Guo, Opt. Exp. 21, 29401 (2013). A.Y. Vorobyev and C. Guo, in Advanced Lasers: Laser Physics and Technology for Applied and Fundamental Science (Springer Series in Optical Sciences, 2013). In press. T.Y. Hwang and C. Guo, Appl. Phys. B 113, 485 (2013). A. Heins and C. Guo, J. Appl. Phys. 113, 223506 (2013). J. Wang and C. Guo, Appl. Phys. A 111, 273 (2013). A.Y. Vorobyev and C. Guo, App. Phys. B 113, 423 (2013). A. Heins and C. Guo, Appl. Phys. B 111, 317 (2013). W. Lai and C. Guo, Phys. Rev. A (Rapid Comm.) 90, 031401(R) (2014). Y. Sun, H. Chen, A.Y. Vorobyev, J. Liu, H. Li, N. Dai, Y. Wang, C. Guo, and P. Lv, J. of Med. Imaging and Health Informatics, 4, 1-5 (2014). Takunori Taira, Hirohide Furutani, Chunlei Guo, Ernst Wintner, Fumiteru Akamatsu, Robert Lucht, and Kunihiko Washio, Opt. Exp. 22, A564 (2014). A.Y. Vorobyev and C. Guo, in Advanced Lasers: Laser Physics and Technology for Applied and Fundamental Science (Springer Series in Optical Sciences, 2014). A.Y. Vorobyev and C. Guo, Opt. & Photonics News, Dec. issue, 57 (2015). A.Y. Vorobyev and C. Guo, J. App. Phys. 117, 033103 (2015). A.Y. Vorobyev and C. Guo, Springer Series in Opt. Sci.193, 101 (2015). W. Lai and C. Guo, Phys. Rev. A 92, 013402 (2015). W. Lai and C. Guo, Phys. Rev. A 93, 043401 (2016). W. Lai and C. Guo, J. of Phys. B 49, 225601 (2016). K. Yin, C. Wang, J. Duan, and C. Guo, Appl. Phys. A 122, 834(2016). S. Singh, N. Reilly, and C. Guo, Laser Focus World, August P.35 (2016). Y. Ogata, A. Y. Vorobyev, and C. Guo, Surface & Interface Analysis 48, 1108 (2016). C. Guo, SPIE Newsroom. DOI: 10.1117/2.3201602.03 (2016). W. He, J. Yang, and C. Guo, Opt. Exp. 25, 5156 (2017). R. Fang, A.Y. Vorobyev, and C. Guo, Light: Sci. & Appl. 6, e16256 (2017). B. Lam, J. Zhang, and C. Guo, Opt. Lett. 42, 2870 (2017). Z. Luo, J. Duan, and C. Guo, Opt. Lett. 42, 2358 (2017). K.P. Singh and C. Guo, Physical Chemistry Chemical Physics 19, 15701 (2017). J. Zhang, Y. He, B. Lam, and C. Guo, Opt. Exp. 25, 20323 (2017). W. Lai, A. Heins, and C. Guo, Sci. Report 7, 2584 (2017). R. Fang, A.Y. Vorobyev, and C. Guo, Imaging & Microscopy (in press, 2017). A. Heins, S. Singh, and C. Guo, Physics of Plasmas 24, 072101 (2017). Y. Ogata and C. Guo, Nano Review & Exp. 8, 1339545 (2017). J. Wang and C. Guo, App. Phys. Lett. 87, 251914 (2005). C. Guo, J. Phys. B (Letters to the Editor) 38, L323 (2005). A.Y. Vorobyev and C. Guo, App. Phys. Lett. 86, 011916 (2005). C. Guo and K. Wright, Phys. Rev. A (Rapid Comm.) 71, 021404(R) (2005). C. Guo, Phys. Rev. A (Rapid Comm.) 71, 021405(R) (2005). A.Y. Vorobyev, C. Guo, V.S. Makin, N.G. Kokody, V.M. Kuzmichev, Proc. SPIE(2005). A.Y. Vorobyev and C. Guo, Phys. Rev. B, 72, 195422 (2005). J. Dai, H. Teng, and C. Guo, Opt. Comm. 252, 173 (2005). A.Y. Vorobyev, V.M. Kuzmichev, N.G. Kokody, P. Kohns, J. Dai, and C. Guo, App. Phys. A, 82, 357 (2006). (Springer Series in Chemical Physics, 2006). J. Wu, H. Zeng, and C. Guo, Phys. Rev. Lett. 96, 243002 (2006). J. Wang and C. Guo, Opt. Lett., 31, 3641 (2006). (Selected into December 2006 issue of Virtual Journal of Ultrafast Science). A.Y. Vorobyev and C. Guo, Opt. Express 14, 13113 (2006). C. Guo, (Invited paper) Proc. SPIE 6118, 611808 (2006). Z. Ma and C. Guo, Phys. Rev. B 74, 233404 (2006). J. Wu, H. Zeng, and C. Guo, Phys. Rev. A (Rapid Comm.) 74, 031404(R)(2006). (Also in the Oc. 2006 issue of Virtual Journal of Ultrafast Science). A.Y. Vorobyev and C. Guo, Appl. Phys. A (Rapid Comm.) online first; DOI: 10.1007/s00339-006-3800-0 (2006). A.Y. Vorobyev and C. Guo, Opt. Express 14, 2164 (2006). C. Guo, Phys. Rev. A (Rapid Comm.) 73, 041401(R) (2006). (Selected into the May 2006 issue of Virtual Journal of Ultrafast Science). J. Wang and C. Guo, J. Appl. Phys. 100, 023511 (2006). and J. Xu, Opt. Express 14, 6681 (2006). A.Y. Vorobyev, C. Guo, V.S. Makin, N.G. Kokody, V.M. Kuzmichev, Proc. SPIE	(2006). J. Wu, H. Zeng, and C. Guo, J. Phys. B 39, 3849 (2006). J. Wang and C. Guo, Opt. Lett. 31, 3641 (2006). J. Wu, H. Zeng, and C. Guo, Phys. Rev. A (Rapid Comm), 74, 031404(R) (2006). Phys. Rev. A (Rapid Comm.) 73, 051402(R) (2006). J. Wang, J. Wu, and C. Guo, Opt. Lett. 32, 719 (2007). A.Y. Vorobyev and C. Guo, Appl. Phys. A (Rapid Comm.) 86, 321 (2007). J. Wang, J. Wu, and C. 32, 719 (2007). A.Y. Vorobyev and C. Guo, Optics and Photonics News 18(12), 43 (2007). J. Wang and C. Guo, Optics and Photonics News 18(12), 37 (2007). A.Y. Vorobyev and C. Guo, Appl. Surface Science 253, 7272 (2007). J. Wang and C. Guo, Solid State Comm. 144, 198 (2007). J. Wu, H. Zeng, and C. Guo, Phys. Rev. A 75, 043402 (2007). J. Wang and C. Guo, Phys. Rev. B 75, 184304 (2007). J. Wu, H. Zeng, and C. Guo, Adv. Studies in Theo. Phys. (in press, 2007). A.Y. Vorobyev and C. Guo, J. of Phys. CS 59, 579 (2007). A.Y. Vorobyev, V.S. Makin, and C. Guo, J. Appl. Phys. 101, 034903 (2007). J. Wu, H. Zeng, and C. Guo, J. Phys. B 40, 1095 (2007). A.Y. Vorobyev and C. Guo, J. of Phys. CS 59, 418 (2007). C. Guo, in Ultrafast Phenomena XV p564 (Springer-Verlag, New York, 2007). A.Y. Vorobyev and C. Guo, App. Phys. A, 86, 235 (2007). A. Y. Vorobyev and C. Guo, Optics & Photonics News 19(12), 30 (2008). Femtosecond laser-induced periodic surface structure formation on tungsten A. Y. Vorobyev and C. Guo, J. Appl. Phys. 104, 063523 (2008). (Selected into October 2008 issue of Virtual Journal of Ultrafast Science). M. Storm, I. A. Begishev, R. J. Brown, C. Guo, D. D. Meyerhofer, C. Mileham, J. F. Myatt, P. M. Nilson, T. C. Sangster, C. Stoeckl, W. Theobald, and J. D. Zuegel, Review of Scientific Instruments, 79, 10F503 (2008). (Seleted into November 2008 issue of Virtual Journal of Ultrafast Science). A. Y. Vorobyev and C. Guo, J. Appl. Phys. 104, 053516 (2008). (Selected into October 2008 issue of Virtual Journal of Ultrafast Science). N.M. Bulgakova, V.P. Zhukov, A.Y. Vorobyev and C. Guo, Appl. Phys. A 92, 883 (2008). J. Wang and C. Guo, Proc. SPIE, Vol. 7005, 70052V (2008). N. M. Bulgakova, A. V. Bulgakov, V. P. Zhukov, W. Marine, A. Y. Vorobyev, and C. Guo, Proc. SPIE Vol. 7005, 70050C (2008). V.S. Makin, R.S. Makin, A.Y. Vorobyev, and C. Guo, Tech. Phys. Lett. 34, 387 (2008). A. Y. Vorobyev and C. Guo, J. Appl. Phys. 103, 043513 (2008); (Selected into March 2008 issue of Virtual Journal of Ultrafast Science). A. Y. Vorobyev and C. Guo, Appl. Phys. Lett. 92, 041914 (2008). (Selected into March 2008 issue of Virtual Journal of Ultrafast Science). J. Wu and C. Guo, Adv. Studies in Theo. Phys. 2, 271 (2008). V.S. Makin, R.S. Makin, A.Y. Vorobyev, and C. Guo, Pis'ma v JTF 34, 55 (2008). A. Y. Vorobyev, C. Guo, V. S. Makin, N. G. Kokody, and V. M. Kuzmichev , Proc. SPIE 7009, 700913 (2008). T.Y. Hwang, A.Y. Vorobyev, and C. Guo, Appl. Phys. Lett. 95, 123111 (2009). (Selected into October 2009 issue of Virtual Journal of Ultrafast Science). A. N. Topkov, O. V. Gurin, V. A. Svich, C. Guo, Appl. Phys. Lett. 95, 121106 (2009). (Selected into October 2009 issue of Virtual Journal of Ultrafast Science). A. Y. Vorobyev and C. Guo, Phys. Rev. Lett. 102, 234301 (2009). M. Storm, A.A. Solodov, J.F. Myatt, D.D. Meyerhofer, C. Stoeck, R. Betti, P.M. Nilson, T.C. Sangster, W. Theobald, and C. Guo, Phys. Rev. Lett. 102, 235004 (2009). E. Fadeeva, S. Schlie, J. Koch, B. N. Chichkov, A. Y. Vorobyev, and C. Guo, Contact Angle, Wettability and Adhesion, vol 6, 163 (Koninklijke Brill NV, Leiden, 2009). A. Y. Vorobyev and C. Guo, Appl. Phys. Lett. 94, 224102 (2009). C. Guo, Laser Physics Journal 19, 1635 (2009). T.Y. Hwang, A.Y. Vorobyev, and C. Guo, Phys. Rev. B 79, 085425 (2009). (Selected into March 9, 2009 issue of Virtual Journal of Nanoscale Science & Technology). A. Y. Vorobyev and C. Guo, Proc. SPIE 7203, 720321 (2009). A.Y. Vorobyev and C. Guo, Optics & Photonics News 21(12), 38 (2010). A.Y. Vorobyev and C. Guo, J. Appl. Phys. 108, 123512 (2010). T.Y. Hwang and C. Guo, J. Appl. Phys. 108, 073523 (2010). L. Pei and C. Guo, Phys. Rev. A (Rapid Comm.) 82, 021401(R) (2010). A. Y. Vorobyev and C. Guo, Optics Express 18, 6455 (2010). A. Y. Vorobyev and C. Guo, Adv. in Mech. Engineering 2010, 452749 (2010). G. N. Gibson, M. Li, C. Guo, and J. Neira, Phys. Rev. Lett. 79, 2022 (1997). C. Guo, M. Li, J. P. Nibarger, and G. N. Gibson, Phys. Rev. A (Rapid Comm.) 58, R4271 (1998). G. N. Gibson, M. Li, C. Guo, and J. P. Nibarger, Phys. Rev. A. 58, 4723 (1998). C. Guo, M. Li, and G. N. Gibson, Phys. Rev. Lett. 82, 2492 (1999). M. Li, J. P. Nibarger, C. Guo, and G. N. Gibson, Appl. Optics 38, 5250 (1999). C. Guo, Phys. Rev. Lett. 85, 2276 (2000). C. Guo, G. Rodriguez, A. Lobad, and A. J. Taylor, Phys. Rev. Lett. 84, 4493 (2000). C. Guo and A. J. Taylor, Phys. Rev. B (Rapid Comm.) 62, R11921 (2000). C. Guo, G. Rodriguez, and A. J. Taylor, Optics & Photonics News 11, No.12, p47 (2000). C. Guo, M. Li, J. P. Nibarger, and G. N. Gibson, Phys. Rev. A 61, 33413 (2000). C. Guo, G. Rodriguez, and A. J. Taylor, Ultrafast Phenomena XII (Springer-Verlag, 2000). C. Guo and A. J. Taylor, Phys. Rev. B 62, 5382 (2000). C. Guo and A. J. Taylor, Int. J. of Modern Physics B 15, 101 (2001). C. Guo, G. Rodriguez, and A. J. Taylor, Phys. Rev. Lett. 86, 1638 (2001). C. Guo and G.N. Gibson, Phys. Rev. A (Rapid Comm.) 63, 040701(R) (2001). C. Guo and A. J. Taylor, App. Phys. Lett. 78, 3211 (2001). C. Guo and A. J. Taylor, Phys. Rev. B 64, 245106 (2001). C. Guo, G. Rodriguez, and A. J. Taylor, Optics & Photonics News, vol. 12, No.12, 68 (2001). G. Rodriguez, C. Siders, C. Guo, and A. J. Taylor, IEEE, Quantum Electronics, 7, 579 (2001). H. Teng and C. Guo, App. Phys. Lett. 85, 1110 (2004). Q. Lin, K. Wright, G.P. Agrawal, and C. Guo, Opt. Comm. 242, 279 (2004).